I’m obliged to David Bill, et al., for their meticulous planning and execution, for sponsoring my first trip to New York (where I also got to meet up with my twin sister in her East Village environs), and for the opportunity to meet a bunch of cool educators I had only previously known online. You’re all a lot shorter than I expected. 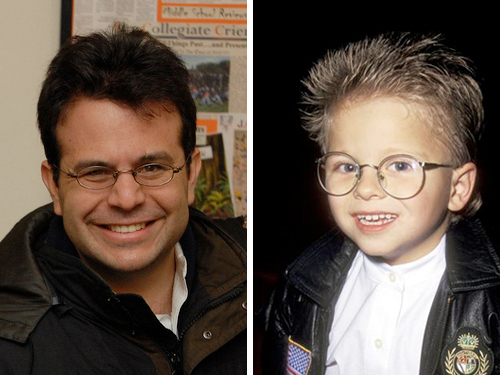 Chris Lehmann = Jonathan Lipnicki. A lot of my co-presenters seemed previously acquainted or at least familiar with each other through similar conference and/or higher-ed circles. As the proprietor of a mid-shelf edublog, I found this intimidating and was grateful for the explicit welcome (especially) from George Siemens and David Wiley, who both treated me like I was anybody else in that bunch of pedigrees. Some of these people presented without slides. Some said that they hadn’t yet finalized the content of their talks. This was the day before the event, which seemed awesome to me. At this point, I can’t give a ten-minute talk without spending two weeks on slides and two weeks rehearsing in front of a bathroom mirror. Someday. Maybe. These slides won’t be comprehensible without the audio, which is as it should be, in my opinion, if you’re playing to the strengths of both mediums. I’ll be sure to post the video of my bit once the TEDxNYED A/V club finishes its work. You’ll hear a lot of people describe their TEDxNYED experience as some kind of overwhelming epileptic fit, an inspiring but exhausting experience. I relate. This isn’t particular, by any means, to TEDxNYED, but at any forward-looking education conference, I tend to follow a predictable (and fast) trajectory from inspired to exhausted to irritated. Speaker by speaker, it was true that the farther removed you were from the daily grind of public K12 classroom teaching, the less restrained you felt to critique and condemn it. I was grateful to presenters who recognized, contra Jarvis, that they were addressing an idealistic crowd already in an agitated state. Those speakers modulated their remarks to a lower frequency both to avoid pandering to their audience but also, in some exceptional cases, to challenge assumptions the majority of the audience clearly held. George Siemens, in particular, devoted four of his eighteen minutes to an off-the-cuff rebuttal of Jarvis’ remarks, specifically cautioning the crowd that “the solutions to the problems of education are starting to concern me more than the problems themselves.” Basically, I’m unimpressed by presenters who throw chum in the water when fish are already leaping into the boat. I was grateful also to presenters who balanced their idealism for the classrooms of tomorrow with pragmatism about the classrooms we have today. Michael Wesch, who put forward a practical model for sociology instruction where students demonstrate their understanding of world history by creating rules and constraints for an open-air simulation that recreates it. Andy Carvin, who described a social studies lesson in which students become more familiar with world geography by contributing to crowdsourced disaster relief efforts like OpenStreetMap. I’m not saying that the only people capable of describing or critiquing classroom teaching are classroom teachers. There are people who don’t work in a classroom who know a lot more about my business than I do. I’m saying it’s difficult, as one of public education’s foot soldiers, to do much with inspiration. I don’t have many places to put inspiration, certainly not as many as the edtechnologists walking away from TEDxNYED minds buzzing, faces aglow, and so it tends to settle and coagulate around my bile duct. It’s too hard to forget that tomorrow I and three million others will have to teach too many standards of too little quality to too many students with too few resources. What can you do with this? An honest assessment. One I can dig, nod up-n-down upon. While I fear that most ‘responses’ to TEDxNYED — or any similar event — will merely be chum in the water on either side of the debate boat, I’m feeling similarly about most of your response, Dan. And yes, we are shorter in real life. And thanks for making that abundantly clear. Both in virtual space and face-to-face. That being said, I’m cool hanging out in your real-time shadow any day. BTW, I’m eager to see what ideas, provocations, challenges, questions, bold ideas, and details-of-details you come up with TEDxBloomington. Expecting similarly lucid pre-con energy from you as we convene the team, fella. Cheers…and great knowing you in real time for the first time. I think TEDxNYED actually was at its best when looked at through the lens of “Great ideas worth sharing.” And I thought there were some really interesting ideas that didn’t even need to be tied specifically to education in the speech… people could draw their own conclusions. Most TED Talks don’t make explicit what the purpose to the audience is… they just talk about something they care about. I thought many of the speakers represented that ideal well. It is on us to figure out what Dan Cohen’s relevance to the classroom is… or how to take Andy’s message to what we do every day. On a personal note… I’d be sad to think that my frequency was at a pitch higher than you’d prefer. For me, that 18 (o.k. — 20, oops) minutes represented a chance to get the ideas that I am most passionate out to an audience that, perhaps, is only hearing about a much more narrow vision of education than what I believe it can be. (Yes, I’d love that talk to be picked up by TED.com, I admit.) I didn’t construct any part of that speech just to get a reaction from the crowd. I actually try to live all that stuff every day. I think my favorite reaction has been from the SLA folks who were there or watched it online and felt that I did represent what we try to do. SLA is our big idea, and I tend to speak quickly and passionately in my attempt to convey that idea. And yes, we’ve got too many standards and too many kids and not enough resources. But that speech is what we at SLA try to do with it every day. And the funny thing was that I did try to push us toward some things I think we as a community need to do. This may be idealistic, but if I could talk about what I’d want for a TED Prize, it’d be to spend a year getting a 1,000 conversations going about what we dream education could be all over the country… and to record them all… and catalogue parents and students and teachers best hopes for school, so that we could have an action plan about where we need to go, because I don’t know that we, as a nation, know what we want or how to get there. But I’d love to find out what it might look like, and I’d love to think that the folks at TEDxNYED would have something to add to the discussion. And I’d think you’d have something to add to the discussion too. You might even speak about your ideas passionately. You never know. I enjoyed reading your reflections on TEDxNYED. While it wasn’t a perfect event (the organizers have already started highlighting a few things they would like to change), it was a great learning experience for me. Congrats on your presentation! It was outstanding. Even though you may have had a few apprehensions the day before the event, you certainly belonged on the speaker list! If you’ve had time to look through Twitter comments, I’m sure you’re well aware that your talk resonated with many people. I had to chuckle at your “mid-shelf edublog” comment. Mid-shelf is where all the hard work happens :). Take care, Dan – a pleasure meeting you. Your last paragraph hits me right in the…well…bile duct. The event was amazing- and I was certainly feeling a little like a fish out of water considering the speaker list and the pretty amazing group of people in the audience. Yet this week I’ve been in an edu-funk instead of being edu-crunk. With a little distance from the event now, I’ve come to appreciate your talk more and more simply because the ideas you’re talking about are ideas you’ve actually worked to put into place in a classroom. It is good for us to think and talk about all the amazing possibilities in education. It is great when we hear from those who are in the trenches taking those amazing possibilities and turning them into amazing classrooms. Strong. I loved your presentation. I felt like we were kindred spirits, both of us buried in the fragments on the edge of an imperfect system trying to do our best for the students we care so much about (me in large required lecture classes where students don’t want to be, and you in 9th grade remedial algebra). I feel your pain too, now back in the classroom grinding away, constantly brainstorming a better way forward. For now I’m moving on with the idea that I can change things from the bottom up – spreading a message that we need to pay attention to the implicit messages in how we teach (like your point that step-by-step math solutions only encourage the idea that all problems are easy … and largely irrelevant). Then I look at what somebody like Chris (and others) have done by moving up the administrative ladder a bit and creating entirely new systems for learning and wonder if I shouldn’t make the leap as well. Back in 1967, Neil Postman and Charles Weingartner were frustrated with education for the same reasons we are today (see Teaching as a Subversive Activity). They looked around and saw all kinds of experiments in education that were working (and the experiments sound just like all the “new” stuff of today – serious games, project-based inquiry learning, etc. ), but their point was not to show that there were effective changes happening in some places. They wanted effective change in all places. 43 years later here we are. And that is what has me down. Dan — Perhaps damningly, I got exactly what I’d hoped for at TEDxNYED (yes, I drank the Ginger Peach Kool-Aid, if you will) in that it was an amazing mix of the big picture philosophical and the little picture practical, both looking toward the future and showing positives in the present. Most importantly, the talks motivated people like me, who stink at networking, to walk out at the breaks compelled to talk and listen and work through the ideas presented. The connections I made, as much as the people on the stage, will have significant impact on me professionally. Lest it get lost, the first and most common topic of my conversations after TEDxNYED has focused on the amazing group of high school students working behind the scenes on every aspect of the live video stream. They embodied, to me, what education and learning can be — teamwork, new skills, connectivity, relevance, passion. And what was even cooler was watching them watch Chris Lehmann, their principal, as he spoke. His emotional investment has infected them, and they were enraptured as he spoke. When you leave the classroom and move on to new horizons — and my apologies if this assumption insults you, but it seems inevitable — I hope you can do so knowing that you have, without question, given birth in your classroom to some untold number of future Dan Meyerses. And by making available your lesson plans, you’ve even found a way to help people you’ll never know. Your career is a powerful testament. Dan, thank you for your consistent willingness to think and learn out loud… there are so many of us out here who are reaping the benefits of that! Earlier this year, I went to EduCon2.2 in Philly. Alone. I tried mightily to coax someone (anyone) from my building to join me. Failed. 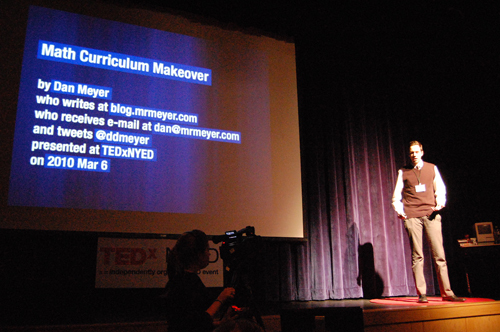 This past weekend at TEDxNYED I was accompanied by three colleagues from my school, which felt really great. I think better in conversation. I learn better in practice. And like you, I think, I am especially interested in hearing from & connecting with those who have some skin in the game and know it. Thank you for not only agreeing to be a part of TEDxNYED (you most definitely deserved to be on that stage. you rocked the house!) but for your very clear reivew of what we just experienced on Saturday. When we started this process, our goal was to follow the TED format. As we move forward it is very obvious that for an event like ours, that is focused on education reform, to be successful we have to allow attendees and viewers the opportunity to process what they have just heard and find that balance between improving our “classrooms today” and planning our “classrooms of tomorrow”. As Clay Shirky has discussed, we are dealing with a period of choas similar to the years immediately after the invention of the printing press. There is a great deal of uncertainty and reluctance to accept this new approach and it is up to us to temper our expetations when trying to change the format of our schools yet still have teachers moving forward, as Michael Wesch states above, from the “bottom up”. It may not be insulting to Dan, but does imply that the best more on. That’s unfortunate. I’m taking a sabbatical from teaching this year, and am learning amazing things. I look forward to returning to my (college) classroom to try things out. Rather than ‘moving on’, maybe something like this could be what we imagine – aback and forth between classroom practice and research/policy work/etc. Thanks so much for your talk at TEDxNYED. You provided far-and-away the most immediately actionable presentation – in other words, the most useful. I’m all for getting inspired and motivated, but as James said, “faith without works is dead” (http://scriptures.lds.org/james/2/20). Thanks for bringing some life to the meeting! – “As the proprietor of a mid-shelf edublog…” You’ll find that the shelf-elevation of most people’s blogs is almost perfectly inversely proportionate to what they think it is. – “…who both treated me like I was anybody else in that bunch of pedigrees.” Dogs have pedigrees. But, come to think of it, maybe you’re on to something here. If you care about improving education, then you’re a brother in the cause. Don’t let anyone convince you that just because you haven’t appeared on a magazine cover or published five books that you’re not capable of making a valuable contribution. Keep doing your thing. First, it must be noted that I was thrilled to meet the two people who I knew were going and who I’ve had lots of contact with over social media i.e. you and Chris Lehmann. Not only did we shoot the breeze, but our discussion on math standards and the politicization of said standards made me connect things in ways that made the conversations we have here seem not too off-kilter. Also of note was how pleased I was to see your presentation, but you knew that. Most importantly, as I mentioned to Boone Gorges, I felt like, for people who aren’t always in the conversations / conferences, like me, it was a great experience. Unfortunately, whether it’s opportunity, time, or network, I don’t always have the access to these types of events that I should. When fellow “big” educators in the room started namedropping, I just pulled out a proverbial marker and drew a question mark on my face. Then I met many of them and found out why they’re so cool. People like Andy Carvin, Mike Wesch, and David Wiley (who indeed has a nice shot considering the tether-ball we threw around in the courtyard) had great ideas that were immediately applicable systemwide and in the classroom. There were certainly some talks that were focused more on uprooting current thinking and improving pedagogical thought. You are right about the preaching to the choir / chum – fish analogy. That is to say, is it about mobilizing these people to make a change or to inform them on the “next” greatest idea about the work of true change? Hmm. Thank you for your comments here, for your words on stage, but mostly for the time we spent at lunch. I have spoken of it in my own braindump. I appreciated and learned from your hard work. But most of all, I consider you more than that “math guy” online that I tell my colleagues they need to read. I consider you a personal resource in the quest for better ways to teach our students the things in life that really matter. I hope you don’t mind. I’ve yet to review my TEDxNYED experience (I’m waiting for the videos to be posted so I can review my notes against them). In the meantime, I’m trolling blogs for others’ reviews. Your speech was one of the highlights for me. IMO, the worst talks were the ones filled with emotion, but little substance. I’ll calling those speakers “preachers.” (You know which they were.) The better were the “philosophers” who asked big, unanswered questions or – like David – made sound moral arguments. The best were those that showed off accomplishments and left the audience *enabled* to implement something similar. You quick deconstruction of a math problem was a perfect example: I can take that and incorporate it into my teaching the very next day. I can’t believe I just got to read through these conversations Dan. This is nothing like teaching 20 years ago. We’ve got to keep tweaking this avenue. 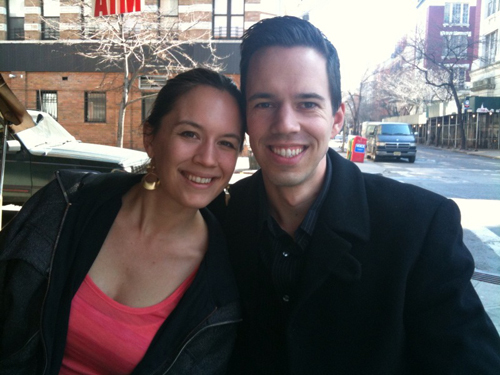 I’ve been following #junto http://bit.ly/axXgpA – there’s got to something more there for us. Check it out when you have a snippet of time. I don’t even know you.. and I’m beaming. 2) as a math colleague – a learning to learn colleague – together seeking more solutions. We live in an amazing time..
Ha. Can I share with you: I used to feel this so often — weird smiles on the faces of women in the crowd who could’ve been around my mom’s age. It was unnerving. They weren’t smiling because of the content but because I was some kind of surrogate for their own sons who were long gone to college. I wrote about this somewhere. Anyway, back to substance. I caught Junto back when Stephen Downes wrote about it. A kind of chat roulette for education if I recall. I’m interested but I tend to observe on the sidelines and rely on front line reports from hard chargers like you.